In part one of this series, we covered the importance of family dinner time, its many benefits, and some practical first steps to reclaiming this time if your home has lost it. Now, for the next step: Serving up one meal (yes, the SAME meal) for the whole family. Your days of being a short-order cook are over! Below is one of our favorite go-to meals that can be prepped ahead of time, makes great leftovers, and can be customized to different nutritional needs and taste preferences. Everyone has fun constructing their very own taco cup (or bowl). I’ve also included some other meal ideas and how to easily customize them for the pickiest of eaters (my son) or the most restrictive of diets (me). Cooked lean ground beef, turkey, or chicken, seasoned with cumin, oregano, salt, and pepper (omit meat for vegetarian option); cook extra for night #2 (Loaded Baked Potatoes). Chopped salad greens with raw vegetables of your choice: shredded cabbage, sliced red bell pepper, tomatoes, and carrots. Black or pinto beans, drained. Toppings (served in separate bowls): Salsa, chopped cilantro, crushed tortilla chips, shredded cheese, jalapeño slices, avocado slices, and plain Greek yogurt (instead of sour cream). Cook ground meat and let cool while prepping salad and toppings. Fill bowl with salad mix, top with ½ cup cooked ground meat and other toppings of your choice. To make a lower calorie taco cup, omit crushed chips and cheese. Bake potatoes at 450° F for 25 minutes or until fork easily pierces through potato. While potatoes are baking, slice vegetables and saute in medium saute pan with 1-2 tablespoons olive oil. Halve potatoes and fluff potato with fork. Top with ground meat, sautéed vegetables, cheese, and sauce of your choice. For picky eaters, keep food separate. Don’t mix in other ingredients with potato. 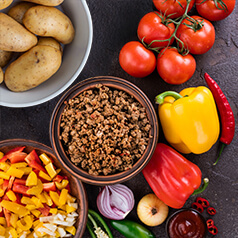 For calorie-conscious eaters, use ¼ of a potato or omit completely and top a bed of cooked vegetables with meat. Pasta with marinara, sliced chicken brats, and steamed broccoli – For picky eaters, keep brat, noodles, and broccoli all separate. For calorie-conscious, omit the pasta and serve marinara sauce and sliced brat over a bowl of broccoli. Grilled tuna and cheese sandwiches with tomato soup – For picky eaters, omit the tuna. If you’re watching carbs, serve tuna on a bed of lettuce, cucumber, and tomato, and drizzle with balsamic vinegar. Bob’s Red Mill Soup Mixes – These are a gem of a find and one of my new favorite discoveries going into the colder winter months. Healthy, hearty and easy to customize by adding meat and other vegetables like carrots and canned fire roasted tomatoes.